My latest animation for Bank of America's digital signage. One of the few motion projects where the bank allowed us to work with a sound designer. Animated in Maya and After Effects. This interstitial animation runs within all Bank of America internal displays and Times Square digital billboards. I was the creative lead on the project, overseeing design from conception through production. This piece was a custom animation created for Bank of America’s flagship location in Charlotte, North Carolina. I was tasked with creating a quick, three-panel animation for an opening ceremony. The client was so pleased with the results that the work was repurposed for all newer branches across the country. This NFL-focused mobile trivia game ran in Times Square and in Victory Park, Dallas. Video content included bank products, footballs and Cowboy cheerleaders. I was responsible for the game’s overall interactions/aesthetics, working with the Flash vendor, and acting as an extra during the shoot. Animated in Flash and After Effects. Carnegie Hall came to Organic looking for a site redesign. In under two weeks, my team created this site design. I created the Flash calendar for the site demo. The entire calendar is dynamically populated via XML, coded in AS3 and features filtering functionality. The iMatch Foundation Finder was the most intensive Flash tool that I created for the Estée Laurder site redesign. The tool is currently live on the Estée website, but it’s missing some small details that I obsessed over. 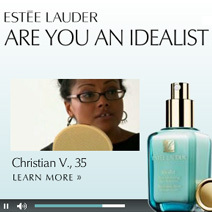 The Idealist banner was a chance to show case video testimonials. The Beautiful Skin Tool was another chance to bring function to the brand’s grace.